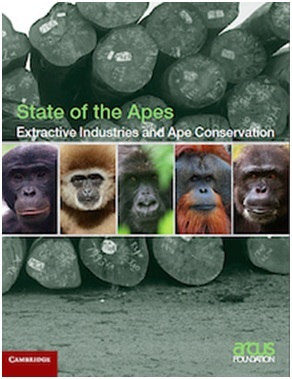 The Arcus Foundation compendium State of the Apes: Extractive Industries and Ape Conservation was released in a press conference at the UNEA. This book is an excellent introduction to entirely new initiatives being launched by governments, extractive industries, financing institutions and biodiversity conservation organizations to introduce extensive planning and implementation of project management and biodiversity offsets involved in mining, logging and oil & gas exploitation. See Extractive industries and apes for more details. Chapter 10 deals with the causes leading to the illegal trade of great apes. This entry was posted in ARCUS, books, publications and tagged ARCUS, books, publications. Bookmark the permalink.